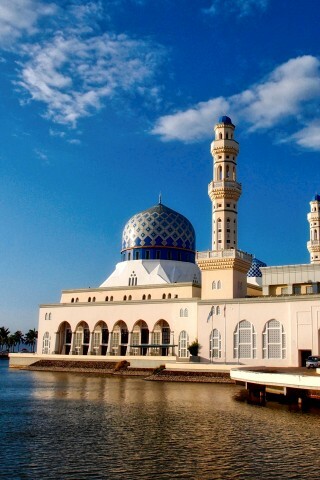 Masjid Bandaraya Kota Kinabalu, Kota Kinabalu’s city mosque, is often referred to as the floating mosque. Browse places to stay in Kota Kinabalu on Agoda.com. Free cancellation. It doesn’t float, but is surrounded by a moat and looks very picturesque — a fine example of contemporary Islamic architecture. Overlooking the South China Sea on Likas Bay and flagged by waving palm trees, it’s particularly lovely to photograph at sunset. The mosque welcomes visits by non-Muslims who are properly attired and free tours are available. Appropriate clothing can be rented from a booth outside the mosque for 5 ringgit. You must register as a visitor and be accompanied by a guide. If you’ve never been inside a mosque before, here you can enjoy the peacefulness it offers without feeling awkward. The surrounding roads are especially busy on Fridays for midday prayers and evening peak hours, so plan your visit to avoid bad traffic. A 5A bus from Padang Merdeka Terminal near Dreamtel Hotel will take about 20 minutes without traffic (1.50 ringgit). Alternatively, a taxi from town should be about 15 ringgit.